How conflicting objectives, divergent strategies, and different tactical approaches can actually be healthy. Why having sales and marketing on the same page can be very damaging if the page is from the wrong book. How curtailing renegades in the interest of harmony could actually hurt your company's revenues and profits. Why sales and marketing alignment should be seen as a bi-product of something else, rather than the objective. This case study is just one of hundreds of educational resources you get access to as a SellingBrew Playbook subscriber. In most B2B markets, your ability to stave-off defections and retain good customers is critical. This video guide explains how to identify the early signs of three costly types of customer defection and how to take action before it's too late. The Triangulated Competitive Audit Guide provides an expanded reference list of the various types of questions you'll want to ask about your competitors and why. Salespeople need to be confident in themselves and in the value of the offerings they’re representing. 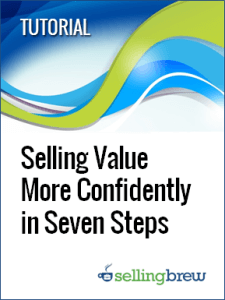 This tutorial helps you give your sales team the confidence they need to sell effectively while maximizing revenue and margin. The balance of power in quoting and negotiations has clearly shifted in the buyers’ favor. In this report, we highlight seven approaches B2B companies are using right now to help their salespeople protect value and margins against today's savvy business buyers.